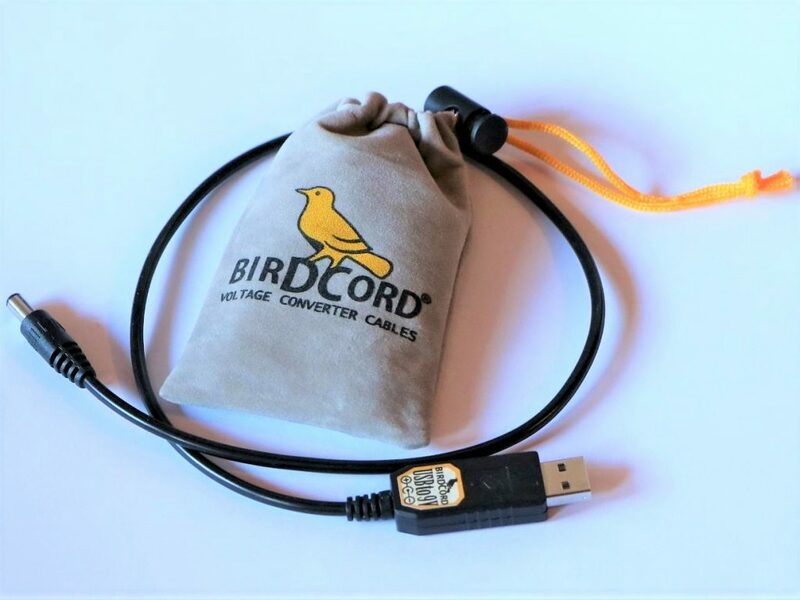 Almost one year ago the Birdcord USB→9V Converter Cable has been released and as you can imagine I learned a lot of things and got a lot of feedback from you since then. I now integrated these lessons into the Birdcord to offer you an even better product. New Packaging: It turned out that the acryl box is very unpracticable because it’s hard to put the cable back in (too small). I now replaced it with a beautiful drawstring pouch with the Birdcord logo on it. Cable Length: Due to popular demand I changed the cable length from 50cm (19.7″) to 55cm (21.7″). Soft Start: Powering bigger devices like the Boss RC505 or RC300 Loopstations or the Digitech Trio+ from USB power banks has been a problem before because these devices need a very high initial current/startup current. Even though the Birdcord could handle this current the power banks would shut down. Not anymore! I now integrated a soft start circuit into the Birdcord that allows starting up these devices without overloading the power bank. It works with any USB power bank with an output current of 2A or higher (small devices still work from any USB port of course). More Output Current: The new revision of the Birdcord is capable of a maximum output current of 1000mA@9V. Having said that I still recommend not drawing more than 700mA for permanent use to have some margin left for short current peaks and to ensure a long life of the Birdcord and your USB power bank. P.S. I didn’t update the product pictures in the webshop yet because I’m going to release new voltage versions of the Birdcord very soon and will combine the photoshoot for all the different versions.